Tailor-made especially for women, this beautiful journal with a feminine touch offers girlfriend-like support along with refreshment from heartwarming Scripture verses.^^Gentle, spirit-lifting content on one page is paired with space for personal responses on the opposite side. Packed with encouragement and thought-provoking reflections, it provides space for journalers to nurture their spirits. Over twenty themes offer a range encouragement for women in all stages of life.^^A great all-occasion, thank-you, or thinking-of-you gift for any woman, it is filled with hand-picked quotations to inspire writing and spiritual refreshment. 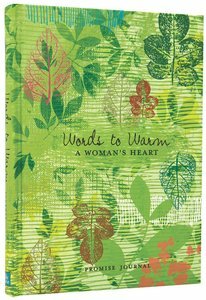 About "Promise Journal: Words to Warm a Woman's Heart"